Kundalini Yoga plays a central role in my life. I want to share with others and transmit to others what touches me about Kundalini Yoga. 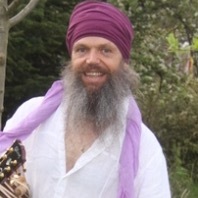 I want to teach to be one with the mission of Yogi Bhajan: If you want to master something teach it. This mission is also described by my spiritual name Sant Mukh Singh - to inspire others by the holy language. Especially today I believe in a basic harmony in life and in universe which we are able to transmit and able to recognize. My strengths: Tolerance and acceptance towards all beings and live, playing guitar chanting mantras, mantra meditation, commitment. Leading Kundalini Yoga classes for all generations from youngsters up on to wise elders.